Up until now, all of my travels have been with at least 1 other person. When a great flight deal came up and no one else could make it, I had a choice: Miss out on an experience or face my fears and Go! The thought of traveling alone especially as a woman scared me a bit. After being inspired by my best friend Paris for taking the leap, and reading other travel blogs I decided to just do it. I was on edge but it was an amazing experience to do things 100% my way and by my own rules. It was the most liberating thing I have ever done. Now that I got that out of the way, lets talk all things Peru! 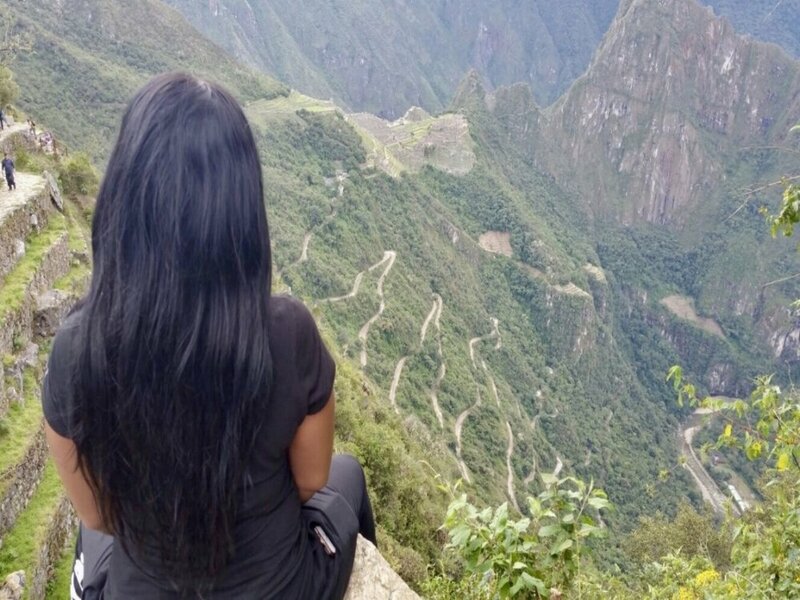 I initially chose Peru because I only wanted to see Machu Picchu. I didn't have much interest in anything else. After further research I became more intrigued by its enriched culture and history. Cusco: Immediately upon stepping outside, I noticed how thin the air was. I felt myself losing my breath by simply walking at a normal pace. This was my body adjusting to the high altitude. My hotel served me a glass of cocoa tea upon arrival and gave me some cocoa candy to help. 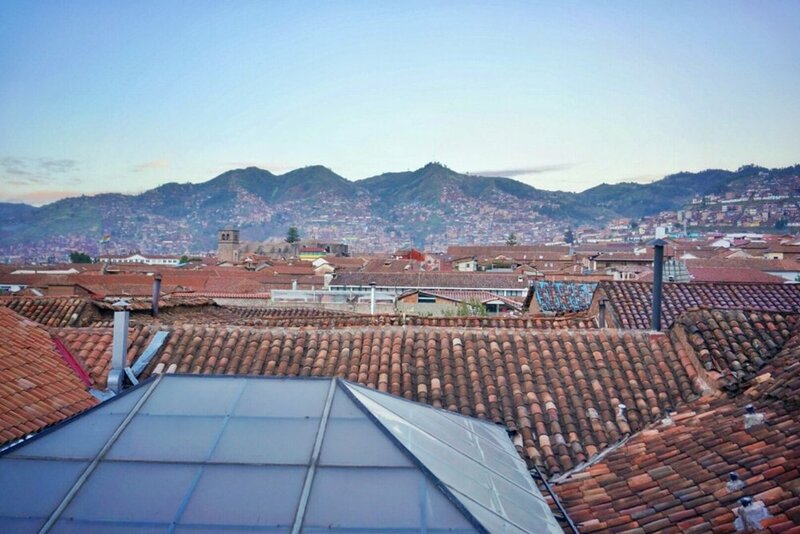 After I got settled which was pretty early, I enjoyed my cocoa tea and a light breakfast while I sat on the roof of the hotel with an amazing view of Cusco. The first day I explored the main square. There were lots of vendors selling tours, souvenirs, massages, etc. It resembled a watered down version of Canal Street in NYC. The people of Peru have similar features. Most are short in height (I'm 5'5 and I was almost the same height as the average man). They have golden skin complexions (like that of Dwayne Johnson but a little darker) with shiny dark straight hair. Their faces were similar to Mexican natives but with smaller lips and more defined cheek bones. The locals of Cusco take pride in their culture. They wore vibrant colors and the style was very modern day ancient Inca (I made that up). The people were very nice to me. Even though their English wasn't great, they did the best they could to help me get around. As a black woman, I didn't feel threatened or like an outcast like I did in a few other countries. I'm a foodie so I was determined to find a great place to eat. The national cuisine of Peru is guinea pig. That was a definite no for me! 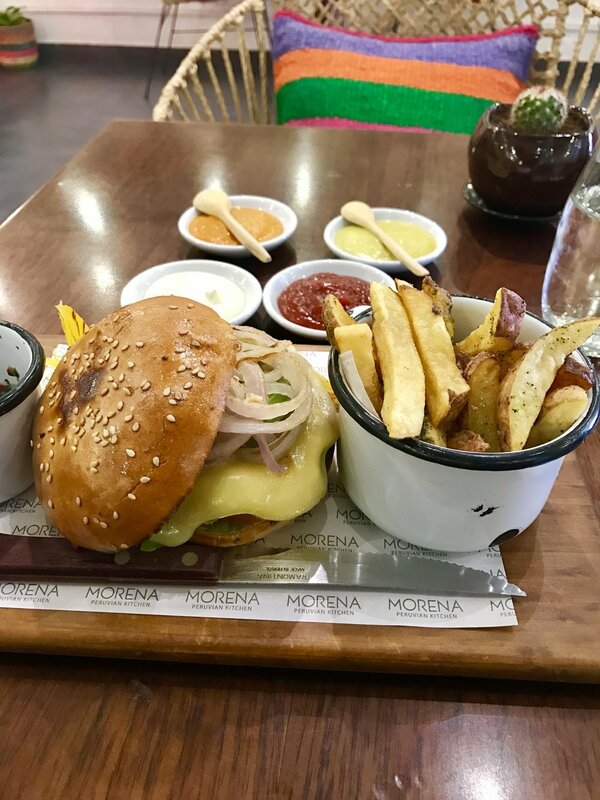 My favorite dishes I had were the quinoa burger with Andean fries and stuffed Yuca balls. The burger was made fresh and was full of flavor. I LOVED the Andean fries. They are shaped like steak fries but seasoned very differently. I could taste the mixtures of onion powder, cumin, garlic and black pepper. They come with 3 different sauces. My favorite was the white sauce that resembled sour cream but with more flavor. 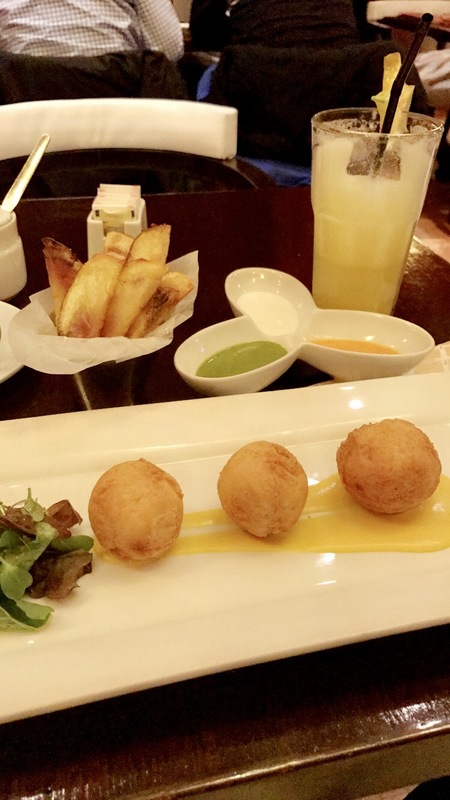 Yuca balls are fried dough molded into a ball and stuffed with cheese and marinated with flavors. I also had Tres Leche (a Spanish cake with 3 types of milk). It was topped with whipped cream, cinnamon and pistachio. I've had this dessert in plenty of places but this one was by far the best. All of the restaurants were reasonable in prices. The ruins of Sacsayhuaman, Q'enko and Tambomachay were all unique but had a peaceful ambiance to each of them. Each site had its individual purpose of the Inca civilization. Ollantaytambo: About 90 minutes outside of Cusco I took a collectivo to get here. Basically, it’s an uber pool that cost $15 (45 sols) per person. 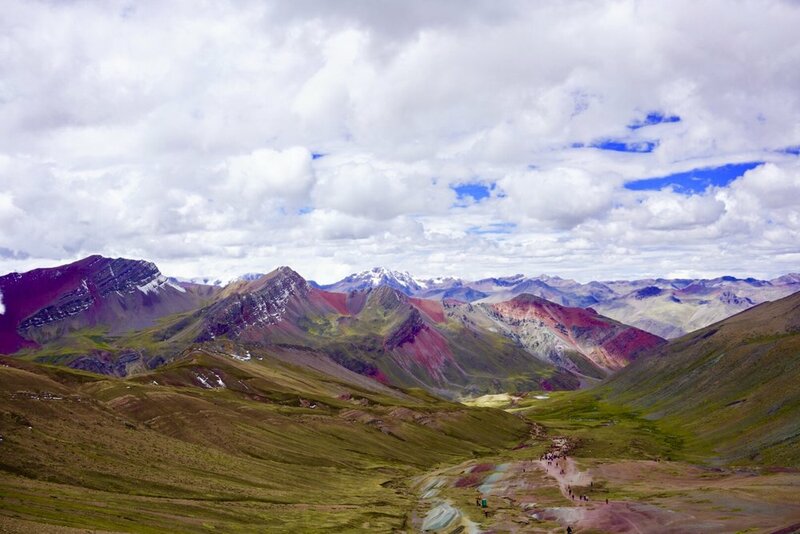 It was a long ride but the views of the sacred valley of the Incas were surreal. It's a small town and not as busy as Cusco but definitely a hidden a gem. I got most of my souvenirs from here. 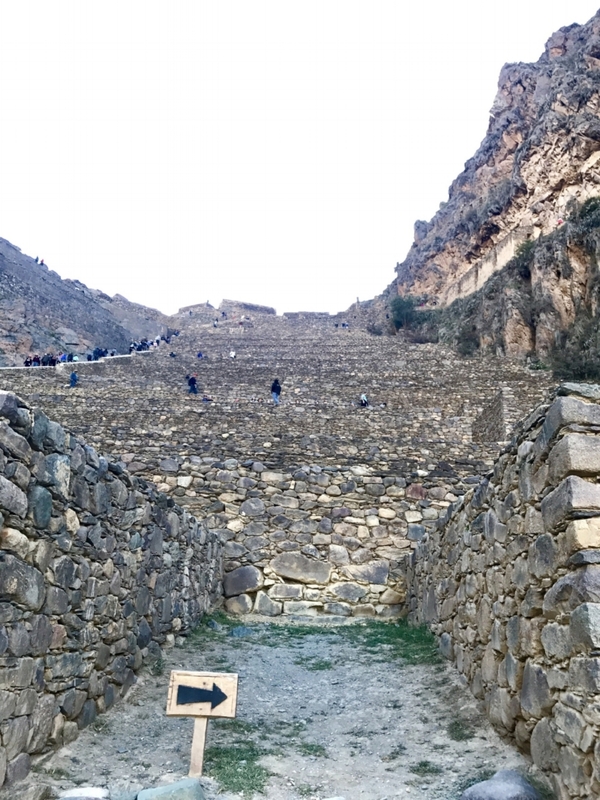 Ollantaytambo fortress was originally built for religious purposes. It became the site of one of the only battles where the Incas defeated the Spanish. I took a 5 minute walk to the fortress ruins and climbed to the top (took it slower to be mindful of the altitude) and watched the sunset while overlooking the sacred valley. I live such a busy life that it's rare I can take advantage of doing simple things like sitting down and watching the sunset. The sounds and views of nature in your backyard are much more appreciative when you're from a noisy city like New York. I can only wish I had the words to describe Machu Picchu. I wish I had a photo or a video that captures its true beauty. It's the only place I've ever been that literally took my breath away. I never understood what people meant by that phrase until I saw this. At one point I sat in the grass and stared at the citadel for over an hour feeling completely humbled. I took the hike up the sun gate which was originally the main entrance to Machu Picchu for the Incas. It takes about an hour to get to the top. Beginners and non hikers should be able to do this with no issues. The changes in weather became a bit frustrating. Early in the morning I was cold with my sweater, by 2pm I'm sweating while walking to the top of the gate. But, what an amazing view! I made sure I got there early so I can spend the day taking in the atmosphere. 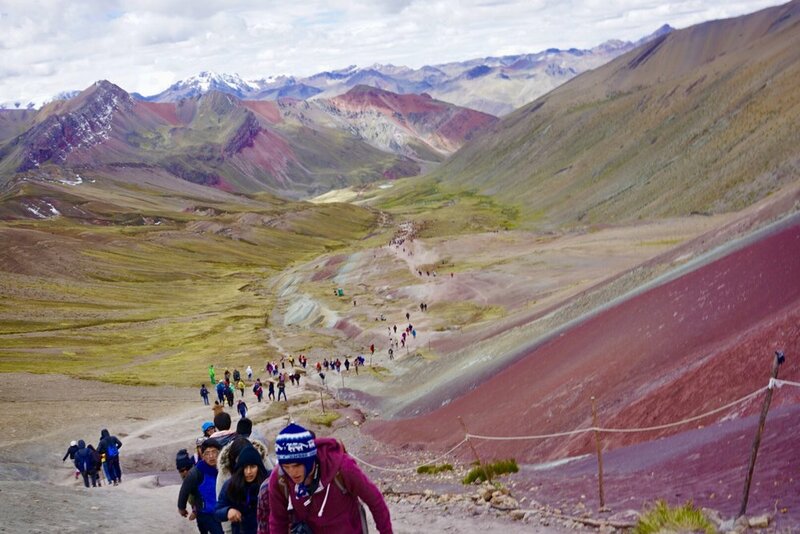 Rainbow Mountain: If I had to describe the view in one word: Extraordinary. If I had to describe getting there: Strenuous. I workout 6 days per week, I lift weights, run sprints and do intense full body circuits. I also go hiking in almost every country I visit. Yet, nothing could have prepared me for this. The grueling weather conditions mixed with the altitude, even a natural athlete would struggle. The air is extremely thin. So walking normally was difficult. Now imagine walking steep heels and even climbing! It started off freezing cold. Then it went to blistering hot. Then moderate. Then hail (yes.... HAIL). Then rain. Then sun all over again which eventually changed back to cold by the evening. I highly recommend you pace yourself for this hike. It is not for beginners. I saw people faint and vomit in front of me. If needed, take a horse. The view from the top: 17,000 feet above sea level. I never want to discourage anyone, however this hike was so difficult that I am still undecided on if it's really worth it. Hands down this was the most physically and mentally challenging experience of my life. Confession: I cried when I reached the top because I was so tired and happy to be alive. LOL. 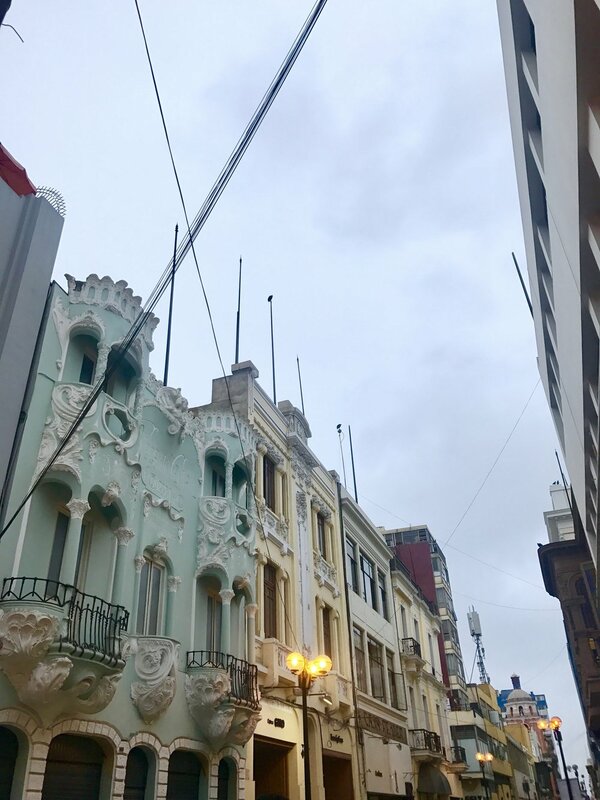 Lima: I explored as much of this city as I could in 1 day (altitude is no issue here thank goodness). My hotel was in Miraflores. It's a touristy area with lots of things happening. It reminded me of NYC. My personal preference as a traveler: I HATE American Touristy things. I hate flying thousands of miles just to see Starbucks, KFC and Papa Johns. When I saw that I was surrounded by a bunch of American franchises that I don't even eat when I'm home, I hauled down the nearest Taxi and said "take me away from here!" He laughed. I saw the ruins of Huaca Pullacera then headed to colonial Lima to see its antique architecture. This is what I came here for. I love antique architecture with vibrant colors and that is what Colonial Lima was about. It draws a huge crowd which didn't bother me very much. I called myself trying to explore and find my own way back by taking the local bus and ended up getting lost (nice job Dev). 2 local women helped me find my way back. They barely spoke English but they seemed determined to help. I really appreciated that! Personally I would've liked to have had an extra day here. I finished the evening having dinner at a waterside restaurant called Mangos. What I loved about Peru was its immense culture and history that goes back thousands of years. I appreciated this experience as a first time solo traveler and I recommend anyone take this trip (or any solo trip for that matter). I met other great travelers who I still keep in contact with. There is something about Peru that I can’t really put my finger on, but I was so intrigued after leaving that I cannot wait to return. Prior to this trip, I wasn't much of a nature fan. To be honest, I didn't see the significance in spending time in the mountains. This trip has taught me that not only is it significant, it's absolutely necessary. Aside from the views being breathtaking, it's a wonderful feeling to unplug and change your surroundings. For those who spend a lot of time in busy cities, any nature related trip every once in a while is good for soul. Lastly, to anyone thinking of traveling solo, I encourage everyone to spend time alone. Learn to enjoy your own company and solitude and most importantly, Love yourself enough to make yourself happy. I hope you've enjoyed this post and I can't wait for you to Walk with Ms. Walker on my next adventure! BEWARE OF ALTITUDE SICKNESS: Cusco is high above sea level (about 11,000 feet). It's very easy to feel lightheaded or dizzy by doing basic things such as walking. I strongly suggest you stay hydrated, drink cocoa tea that is sold anywhere and given at almost every hotel as well as chew on cocoa candy. Exchange your money on the street in Cusco. At the airport the exchange rates are higher. Wear comfortable shoes! You will do a lot of walking and exploring. Dress appropriately: It gets cold at night so I suggest bringing a thick sweater and maybe a scarf. It's also warm during the day so prepare to remove layers. BARGAIN: every thing can be negotiated in Peru. Souvenirs, tours, etc. don't take the first price they offer you! Flights: My ticket from NYC to Lima was for $418. I booked my flight on Travelocity. My roundtrip flight to Cusco was $135 also booked on travelocity. My Restaurant Recommendations: Cusco: Incanto, Cafe Morena, Limo Lima: Mangos - waterside restaurant and food was decent. Touristy vibe and a little expensive. I only recommend if you like the American tourist thing. Machu Picchu Entrance Tickets can be purchased here: http://www.machupicchu.gob.pe/ tickets are NOT sold at the entrance. Tierra Viva Cusco Plaza' in Cusco. I recommend staying here. They gave great food recommendations, told me the best place to exchange money, and it was steps away from the main Square 'Plaza de Armas'. Hotel Sol in Ollantaytambo. Besides the view from my balcony, I do NOT recommend this hotel. It was expensive but I felt like it was low quality in service and cleanliness. I was better off booking a cheaper place. Novotel in Cusco. More modernized hotel on the expensive side. Very nice if you want to spend a few extra bucks. Hotel Esperanza in Lima. I chose a cheap hotel to only hold my bags. I spent a full day in Lima and didn't sleep in this hotel.